Circle of Hope Bracelets is a community-service not-for-profit organization that offers its dedicated volunteers opportunities to raise money for the fight against cancer. Volunteer activities include making and selling bracelets. Profits from these activities are donated to cancer causes, particularly cancer research, education, treatment and care. 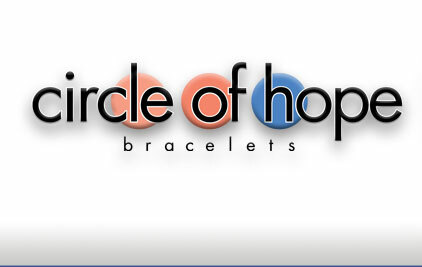 Since its founding in 1999, Circle of Hope Bracelets has donated more than $3 million to more than 100 cancer charities. You can designate donations to your favorite cancer charity by selling Circle of Hope Bracelets. You can give a home party for your friends, take the bracelets to your workplace, church, school, craft or health fair, etc. To find out more, contact us at info@circleofhopebracelets.org. Through the work of Touchwood Creative, circleofhopebracelets.org is now a full-featured eCommerce site, with greatly enhanced ability to serve our customers and supporters. Our thanks to Touchwood Creative and its managing partner, long-time COHB advocate Lisa Caplan.